On the eastern coast of the North Island in New Zealand is the Bay of Plenty. Across the harbour from Tauranga, New Zealand's 5th largest city, sits the 'Mount'. 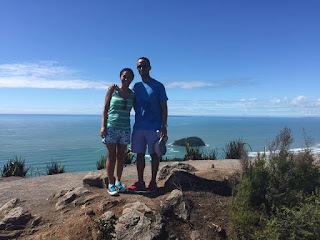 Mount Maunganui (officially known by its Māori name Mauao meaning caught be the dawn) is almost surrounded by the Pacific Ocean, with a beautiful beach on one side of its peninsula, and Pilot Bay on the other. No trip to the Mount is complete without a trek to the top. There are marked walkways leading to the top, a climb that will take between 20 - 40 minutes depending on fitness levels. Once at the summit you are rewarded with a stunning view of the beach, all the way up to Papamoa towards the south-east. Moturiki Island is connected to Mount Maunganui beach by a man made land bridge. In the summer months surfers and swimmers enjoy the water. Those who prefer land can relax in the many cafes or at the nearby Mount Hot Pools. If you're really hungry after a busy day on the beach try Kwang Chow for a Chinese buffet feast.